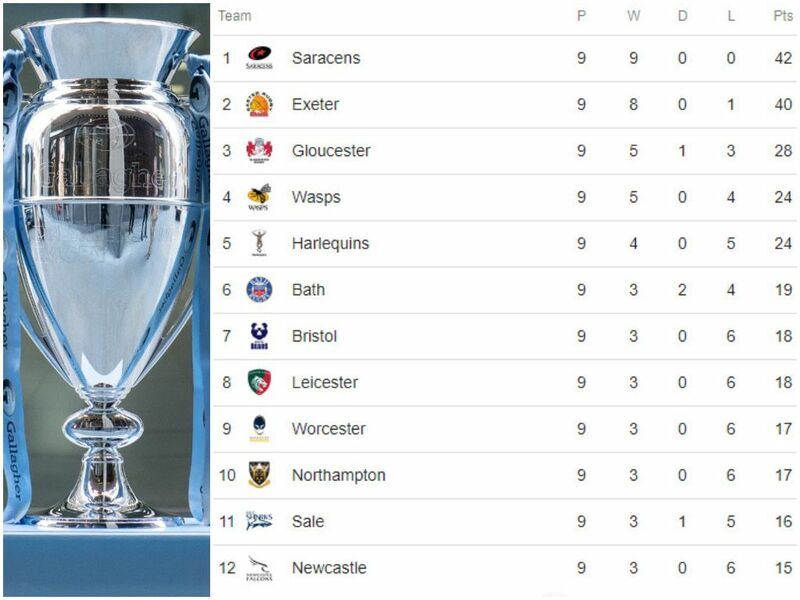 We break this week for the Champions Cup, but already it should be clear to all that this will be no ordinary Premiership season. The past has frequently been a close race at the top, a bit of a mid-table scrap and one, or maybe two basement-dwellers, one of whom manages to find its mojo sometime in the spring. This year, it’s the opposite. We have two summiteers, a close race for third and a huge, seven-way scrap to not be the team staring into the abyss. A freak set of results the weekend before Christmas could send Bath, currently in sixth, to the bottom. Leicester are also only a defeat and some other teams’ wins away from bottom spot. If you look at the cash on offer from CVC for a stake in the Premiership, you might also be able to see why. That bid – said to be worth GBP 20m to each of the Premiership clubs – is going to add some intrigue to each team’s recruitment drive for next season, a post-World Cup season in which a huge number of the current All Blacks‘ faithful will be looking for pension top-ups in Europe in the twilight of their careers. Kieran Read, Beauden Barrett, Ben Smith, Owen Franks and Ryan Crotty are all firmly on European radars. None of those big names would look out of place on the back of Leicester or Bath shirts, but clubs and players like to sort their futures well in advance these days and while the race to avoid the drop is so open, it’s going to have an impact on how these players perceive their futures – it could even swing a decision to head to the UK or to France. Relegation has been debated for what seems a pointlessly long time. The eternal arguments about clubs being able to plan long-term futures securely are constantly weighed up against the notion of open competition and the sporting principle of getting what you deserve if you aren’t good enough. We’ve always been of the opinion that relegation is a necessary evil. It promotes ambition from below, adds competitiveness to fixtures during the season even away from the table summit and keeps the game honest, for the large part. Wondered how long it would take for the Premiership promotion and relegation debate to kick off again. One look at the league table tells you why. As Melville pointed out on Monday, there’s no chance of that changing mid-season either. However, the CVC injection is a game-changer. While the RFU has no grounds for interference in what clubs or Premier Rugby do with it, if ever there was an opportunity to rethink the club and divisional structure of English rugby, this was it. That cash should do two things. Firstly, clubs should use it to clear some of the debt that continues to build within the English club game. Secondly, it should be used on clubs reinforcing their academies, development systems, outreach systems and player welfare systems to ensure – absolutely ensure – stability for the long-term. And then, you could conceivably think about a top-level league of 12 to 14 teams where relegation is no longer an issue because you’d know – through extensive auditing – that it would be sustainable. That’s not why journalists and clubs are raising the question now of course. They want to make sure they can get the Reads and Barretts come next season, even if this season goes horribly wrong. But CVC’s cash represents an opportunity towards a sustainable club system without the need for relegation and it would be significantly narrow-minded of the clubs and Premier Rugby not to examine it, if relegation really is that bad a concept for the current system. We have talked over and over again about the need for reduced player load. We have wondered over and over again how many players are playing through injury when they simply shouldn’t be. We have pointed out over and over again that at some point, the administrators of the god-awful over-stuffed rugby calendar may be on the end of a comeuppance from the players themselves. And we are sure that this report released yesterday is the start of it. – 48% of players surveyed believe that 21-25 is the optimum number of matches to be played per season. – 45% of players said they were pressured to play or train when not fully fit. – More than half of players think Test matches should not be played outside of international Test windows. – 23% of players have felt pressured by their club not to play for their country. – 40% of those players succumbed to that pressure and didn’t play for their country. That first figure is perhaps the most pertinent one out there. But to know there are actually clubs pressuring players enough that national honours are turned down is staggering. The players have spoken – and being as they are the ones to entertain us, we ought to be behind them. How will the administrators react?